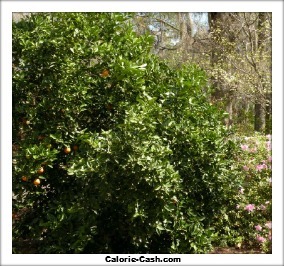 Ok,I have built this chart to help you estimate about how many calories in an orange. The turning point occurs when oranges are about 2 and 5/8 inches inches in diameter which is about the size of a tennis ball. Smaller oranges are about 50 calories and larger oranges are about 75 calories. A really big orange will be close to 100 calories. If you are trying to lose weight, an orange is an excellent food choice. It is a much better choice than orange juice. The fiber will fill you up more and last with you longer. I do not know about you, but I can drink 200 calories of orange juice in a heart beat. Add shredded coconut to orange sections to make one of my favorite desserts...Ambrosia. Another great dessert...peel an orange and then slice it across the sections...drizzle with about 1/4 teaspoon honey. Starting in November I can eat oranges for about 5 months. Gardening and picking fruit also is a fun way to burn a few more calories. What are your favorite healthy ways to eat an orange? 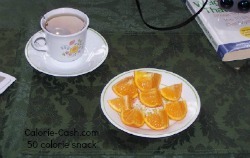 Now for nutrition, As you can see an orange is a good source of vitamins and minerals. After a big 200 calorie bowl of soup, I just had a great 50 calorie snack. It was nothing more than an orange cut in eight pieces with a cup of tea. it is messy so be sure to have some napkins. Pour the juice that is left on your plate into the rest of the tea.